Black Rhodium has been overhauling its lower-price ranges of late, introducing new models that bear some clear resemblances to the old but differ in various ways. The most obvious family trait in Tango is the silicone rubber insulation, which has been a staple for many years. 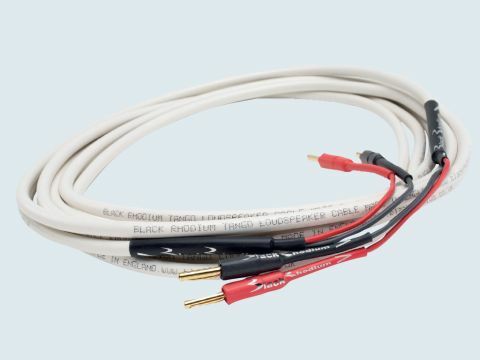 We're still not sure to what extent the insulation (particularly on speaker cables) influences the sound, but that fact that there does seem to be a Black Rhodium 'house sound' is one of the strongest indicators that there is an influence. Round in overall cross-section, with a diameter of around 7mm, Tango uses silver-plated conductors of modest size and, while resistance is not alarmingly high, we wouldn't recommend it for very long runs. Our test sample of 5m is probably fairly typical, but if your cables follow a convoluted route for many metres there's a chance of some loss of bass control. With many speakers, that could be a dangerous direction to take, for the bass of the Tango is certainly not shy about coming forward. In fact, we'd stick our necks out and call it a clear departure from neutrality, but at the same time we'd have to admit to rather enjoying it, especially with smaller speakers. The good thing is that control is barely compromised, so there's still plenty of insight into what's happening in those lower octaves, but there's an added richness that reference cables don't exhibit. If you're looking to enhance a bass-light system, it could be ideal. Higher up the spectrum, treble is a little shut in but generally clear, while midrange exhibits moderate to good levels of detail - pretty typical performance at this price level.